HVAC Industrial/Commercial Impeller Fans for Agriculture Swifter® SW/SE series industrial fiberglass impellers are extremely durable and robust. Our unique manufacturing process and use of specialty composite materials produces a higher quality fan than sheet metal versions. The SW/SE series are made of lightweight components for ease of installation and maintenance. Moreover, the fan blades have a cutting-edge design with a sleek and smooth appearance. See complete list of industrial impeller features and benefits. SW/SE series impellers are ideally suited for corrosive conditions. The fiberglass blades are corrosion resistant to moisture and over 150 chemicals. In addition, the SW/SE series has the ability to run up to 15% higher RPM for enhanced performance as compared to aluminum or thermoplastic impellers. The SW/SE series blades have a state-of-the-art aerodynamic design that reduces vibration and delivers required airflow at lower tip speeds for a quieter and more efficient operation. NOTE: Minimum Order Quantity - 100 fans. 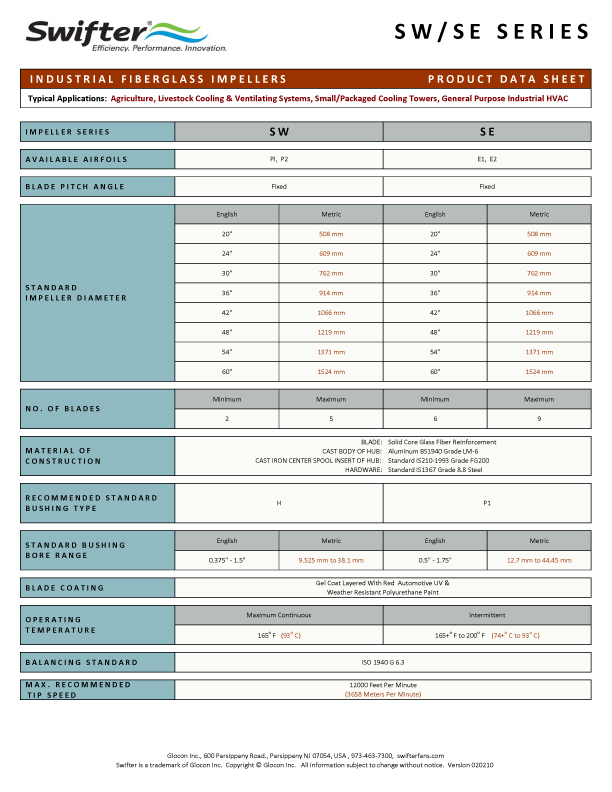 Download the SW/SE Product Data Sheet. Access our online Impeller Selection Program.